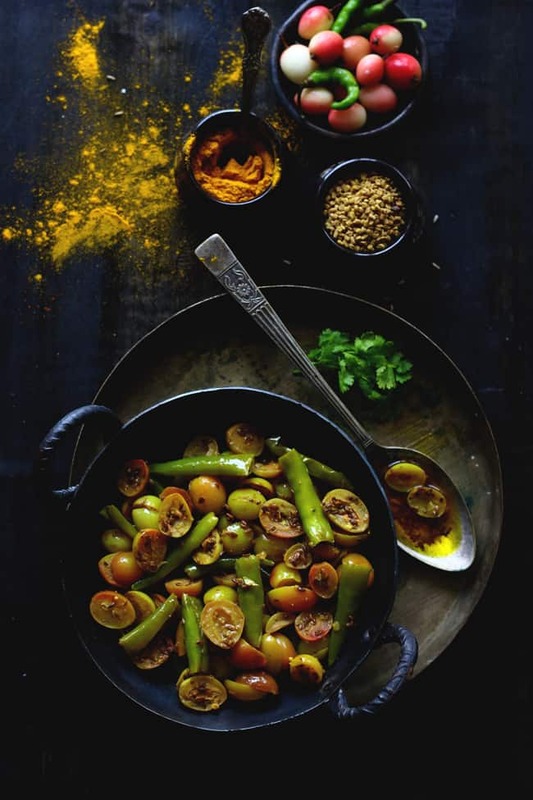 Karonde Mirch Ki Sabzi is a delicious Indian side-dish prepared with seasonal berries called – karonda (natal plum). This karonde ki sabzi is more of a condiment or pickle served on the side with usual main-course dishes. It’s full of flavours and definitely satiate all those umami cravings. It’s almost end of August, and predictably the monsoon season is expected to last till mid of September. These days North India is damp and grey, the frogs are having a ball and I deal with it all by keeping myself busy in the kitchen. I love the thunderstorm, the lightning in between the clouds and the shades of grey during the day itself. I make myself a strong cup of coffee and flip the pages of cookbooks in search of new recipes. During this entire season, we are enchanted by the craving for spicy food. Yesterday morning I went to the market and came home with beautiful Karonda (natal plum) having natural vermillion shades. In English, Karonda is known as ‘Carissa Carandas.’ I must admit it is quite a fancy name for a humble wild berry. I had no special plans for them, they just were the most attractive looking thing at the vegetable stall and that is the only reason a bought a kilo of karonda. Then the husband floated the idea of Karonde Mirch Ki Sabzi. Apparently, it was his childhood favourite side-dish. With a huge karonda shrub in his backyard at the ancestral home, he had enough of them while growing up. And then the berries beckoned. For lunch, we had crisp and flaky triangle parathas with karonde ki sabzi. It was so full of flavors and well suited to the weather. And especially husband’s face beaming with delight and satisfaction. 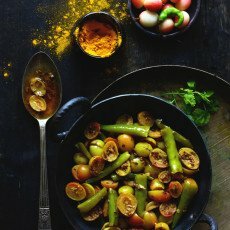 Karonda has a tangy flavor to it which needs to be toned down with the green chilies and spices in this recipe. The choice of mustard oil for cooking karonde mirch ki sabzi was a good decision. 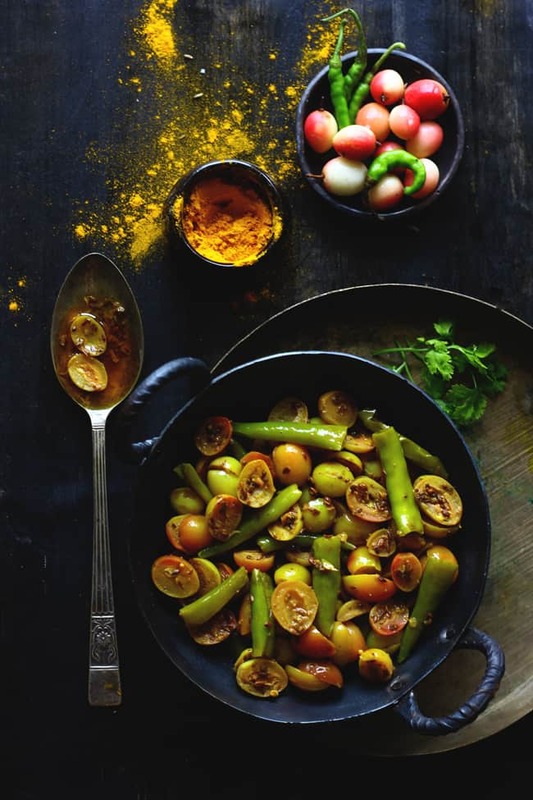 The pungent flavor of mustard oil compliments the spiciness of the chilies and the tanginess of the berries. Last year, at the same time we tried the same recipe with the thick, long green chilies only. And it was a huge hit. 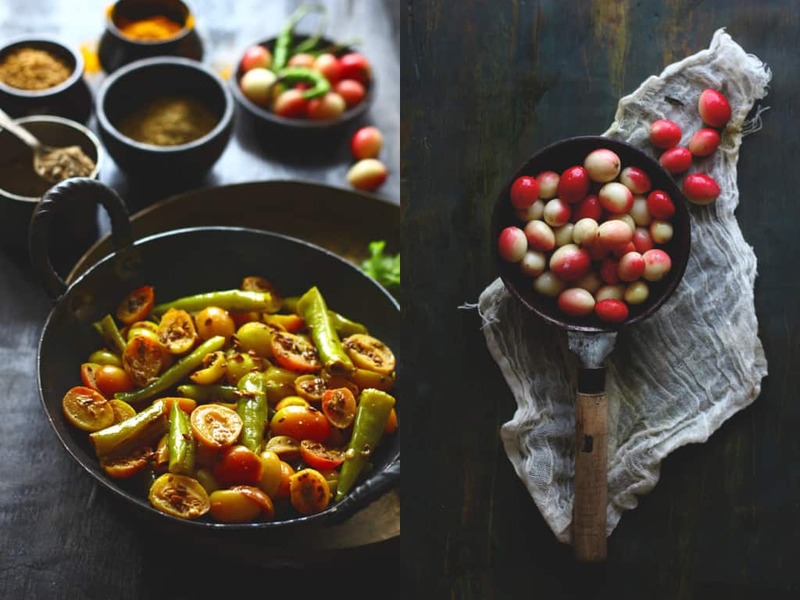 Both of these recipes are a great side dish to be served with any Indian curry or dal. Karonde Mirch Ki Sabzi is a favorite seasonal side-dish recipe. 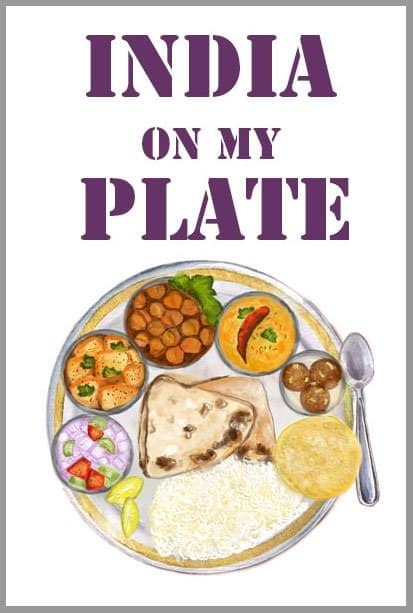 Serve karonde ki sabzi with chapati and raita for a delicious meal. Rinse 2 - 3 times karonda in water to remove all the dirt and mud particles. Wash the green chili as well. Transfer karonde and green chili in a metal colander. Let them sit in a metal colander for 10 - 15 minutes to drain all the excess water. Wipe the green chili with a clean, dry kitchen towel. Cut each piece of karonda into two equal halves. Cut each green chili into two to three pieces. Slit few from center lengthwise. Heat mustard oil in a skillet ( buy it here ) over a high flame. Once the oil reaches the smoking point reduce the heat to medium. Add cumin, fenugreek, asafoetida and carom seeds. Fry for 10 - 20 seconds. Next add turmeric powder, coriander powder, and fennel powder. Fry for 10 seconds. Now add chopped karonda and green chili. Stir to mix. Season with salt and cook covered over medium heat for 5 - 6 minutes. Open the lid, check for doneness. Sprinkle achaar masala, mix and cook uncovered for 5 more minutes. Turn off the heat. 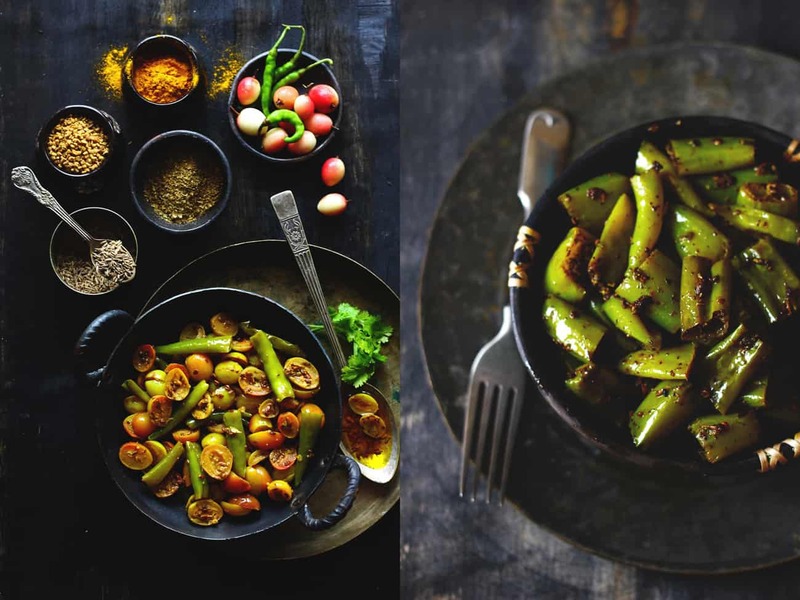 Serve karonde mirch ki sabzi with paratha/roti. You can store it in the fridge for a week or so. I love mirch karonda, and it is a favorite at our home. My daughter loves to eat it with mathri. I loved the look of your post. The pictures are superb. 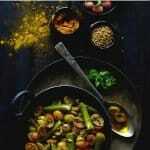 what beautiful photographs – I can smell the spices, I want to taste……delicious!! !